I am a 40 year old male and my ACL experience started at 6:30 a.m. November 9th, 2007. I had gone to the gym, done my normal weightlifting and instead of doing the normal cardio(treadmill, elliptical) I decided to play a little basketball with my friend and my two sons. That one simple decision would have a huge impact on the next few months of my life. I was going for a pass and my 16 year old son ran into the side of my leg. I immediately heard a “pop” and I fell to the ground. There was about two minutes of excruciating pain and then I felt ok. I stood up and tried to walk but my knee was not stable and would not support me. I went to urgent care and they gave me a brace, pain medications, and an appointment with a doctor the next week. The doctor didn’t think I tore my ACL but wanted me to do an MRI to be sure. 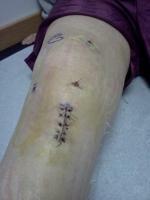 The days before my MRI, I researched and researched ACL tears and surgery. Wow, talk about information overload. There was good information, some scary information, and a lot of confusing information. The one thing I was sure of though was that I did NOT want to have this surgery. But we don’t always get what we want…the MRI showed an MCL and ACL tear. The next appointment was one with the surgeon to talk options. You don’t have to have surgery. However, you will be limited to what you can do in terms of activities. For me, I was not willing to give up some things I enjoyed doing so I opted for surgery. Of course even surgeries come with options so I was faced with yet another choice to make. Autograph, where they take tissue from my hamstring or patella tendon or Allograph, where they use tissue from a cadaver. I chose the allograph. The main reason was the recovery time and the fact that my surgeon recommended it for someone of “my age”. Allograph surgery typically has a faster initial recovery but is generally not recommended for the serious athlete. I say initial since the total recovery for ACL surgeries is the same (6-9 months). However, with the allograft, you are walking and returning to some “normal” activities a little sooner which was important to me. My surgery was scheduled for 8:15 a.m. December 12th. I have to say, I was very nervous and scared and consider backing out more times than I can count. But the day arrived and so did I. The anesthesiologist was one of the first to visit and gave me an option to have a nerve block. This carries some risk, but after talking to my doctor, he highly recommended it, and after having it, so do I. From a pain standpoint, it really gets you through the first night with very little pain. Then I was wheeled into surgery and before I knew it, I was waking up. I was freezing, but I was waking up. The nurse put a little hose under my covers and it was blowing the warmest air I have ever felt. me a couple of pain pills and the pain subsided in about 10 minutes. Probably a 5 on a 1-10 scale. After about an hour, up on crutches, into a wheel chair and home I went. I went home, propped my leg up just like instructed and watched TV. The first night of sleep wasn’t bad at all. Hard to get comfortable due to the brace they have on your leg, but from a pain standpoint, all was well. I woke up on day two with my quad muscles twitching. I was very excited. I knew that was a very good thing and sometimes it takes much longer before the quads start firing. Anyway, day two was more of the same. Leg propped watching TV. Night two was probably my worse sleeping night. Te pain pump was empty and the nerve block had worn off. However, I had kept up on the pain pills so although there was some pain, it was around a 2/10. Day 2 was also the first day of my physical therapy. I was somewhat nervous about this, I must admit. However, your physical therapy is the key to your recovery. I won’t go through the exercises that you will go through since they are outlined on this site. The goal is to slowly build up your leg and core strength. They start slow and with each session, gradually get more intense. I cannot emphasize the importance of the physical therapy enough...it is critical to your recovery. I have a great physical therapist that not only has worked on the physical recovery but has answered my many questions as well. My wife said during the first two weeks that she loved when I came home from PT since my spirits seemed to be much better. I was off of my crutches after 5 days and out of my brace around day 14. This is my experience; both of these have a range. Your type of surgery is the main driver. Even after I started walking without the crutches, I did not spend a lot of time on my feet. My knee was very sore and if I spent too much time on it, it would hurt and swell. I wanted my time spent on my feet saved for my PT (I currently go 3 times weekly). Around the 3 week mark I was spending more and more time on my feet and pain in my knee was diminishing daily. I am now 4 weeks post-op and the knee feels great and from a walking standpoint, I can spend as much time as I want on my feet without the knee hurting. My experience is far from being over. I have months of PT still ahead but feel like I have made it through the worst part and the part that concerned me the most before my surgery. If you are facing ACL surgery, I hope my story helped and encouraged you a little. Although it is not an easy surgery or recovery, it was not nearly as bad as what I had feared. If you are getting ready or just had this surgery, I wish you all the best and welcome you to this ever growing club. I plan to update my story periodically as I continue through my rehabilitation.